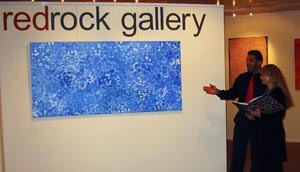 redrock gallery is recognized as one of the finest and most reputable Aboriginal Art galleries in Australia, displaying some of the most highly successful Indigenous artist both locally and internationally. We are located in the Art precinct of Melbourne, mid level at the Southgate Arts and Leisure center overlooking the famous Yarra River. It is a wonderful and inspiring art space, displaying exciting and imaginative indigenous works. Our most recent and second gallery is situated in the newly established area of Harbour Town, Docklands, Below the observation wheel and combined houses over 400sqm of space, displaying some of the most exclusive works in the history of Aboriginal Fine Art. Australian Aboriginal culture is the oldest existing culture in the world, and as such, its wonderful history and spirituality touches the heart of every living person. Contemporary in style, spacious, immaculate and well presented, redrock gallery displays paintings by notable and famous Aboriginal artists including Clifford Possum Tjapaltjarri, Johnny Warangkula Tjupurrla, Gloria Tamerre Petyarre, Katheleen Petyarre, Michael Nelson Tjakamarra, Margaret Turner Petyarre, Peter Overs, Gracie Morton, Josie Petrick Kemarre, Walala Tjapaltjarri, Pansy Napangardi, Ronnie Tjampitjinpa and Long Jack Tjakamarra. Mem Tjampitjinpa passion for Aboriginal Art and culture is a reflection of his 20 years affiliation and direct dealings with Aboriginal communities. His professional and trusted interactions with international collectors, major auction groups as well as his expert orchestration of Worldwide exhibitions, reflect the continued confidence in his ability to perform to the highest standard. An avid collector with a discerning eye for quality Aboriginal artworks, Mem boasts a phenomenal diverse range of works from various renowned Aboriginal artists. Striving for quality, narrative, colour, movement, truth and innovation is redrock’s mission. Mem’s friendly manner and charisma puts patrons at ease. His wealth of knowledge and experience with Australian Aboriginal art and culture is widely appreciated and is a reflection of his personal success. Walk into redrock gallery and you are greeted by wonderful and mystical sounds presented in a harmonious atmosphere. With a bit of nudging Mem will oblige and play a tune on the didgeridoo giving pleasure to his audiences who in turn applauds rather loudly. Acclaimed and recognized as one of the most unique modern Didgeridoo players today, he has been interviewed on numerous radio programs, appeared on television documentaries and in numerous publications. Touring the world with the renowned Australian bush band, THE SUNDOWNERS, has always run hand in hand with his love of art. 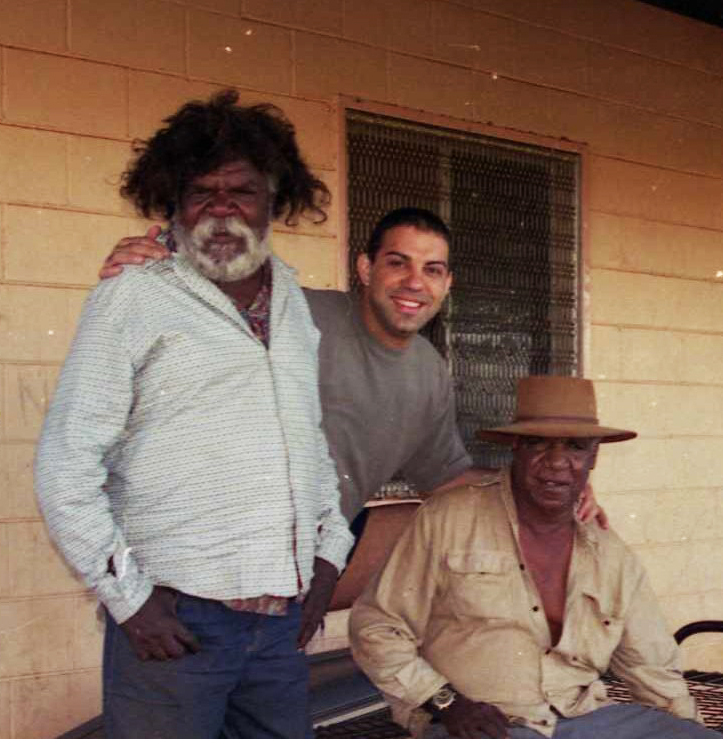 Orchestrating art exhibitions, educating people about Aboriginal culture or representing Australia as an Honorary Tourism Ambassador have always been his first love. Through visiting and experiencing a variety of Didgeridoo playing techniques by traditional Aboriginal and Non-indigenous enthusiastic players, Mem has become something of an explorer, receiving the secret mythologies of the land and of the Aboriginal tribes, which lay quietly whispered through the centuries. His passion for Aboriginal culture and his bond with many Aboriginal communities led him to open his first gallery - the smallest Aboriginal gallery in Australia located in the city of Melbourne. From humble beginnings, Mem expanded, moving to bigger and better premises - thus the inception of redrock gallery as it is today, where the finest and most exclusive artworks can be found. The artworks are personally commissioned by Mem, spanning across three major areas, Arnhem Land, the Kimberleys and the Central Australian region. Every painting is certified and documented with a photo of the artist with the painting. The artworks are painted on the best quality Belgian linen. The artworks also include traditional dot paintings and contemporary design. Paintings range in size from 30cm x 30cm panels, through to 100cm x 200cm. Apart from paintings, redrock gallery also stocks genuine top quality didgeridoos from Arnhem Land. Books on Aboriginal art, artists and culture, line the shelves at redrock gallery. Reference books are available for the discerning patron. redrock gallery has a regular clientele of local, interstate and overseas visitors. Door to door delivery of artworks is available locally, interstate and overseas by a reputable carriers. Priding himself on personal client attention – locally or worldwide, communication by telephone and email service, newsletters advising of new exhibitions, new artists, new paintings and news of his visits of other major exhibitions or his travels locally or overseas, is top priority for Mem. Several in-store exhibitions from 1998 to 2010 presenting some of the finest art collections by Australia’s leading Aboriginal Artists, have proceeded at the gallery. Keeping at the forefront of this art movement has necessitated regular visits to prominent exhibitions held locally and instate in Australia. 2010 will once again be an innovative and inspiring year for redrock gallery. Our range of exhibitions will serve as a platform for many emerging talents. redrock gallery strives to nurture and promote fresh and exiting talent as well as paying homage to Australia’s most celebrated and sought after Aboriginal artists. We believe this fusion will serve a source of inspiration, and a closer and more spiritual understanding of Australia’s rich and multi-faceted Indigenous history. redrock gallery and Mem welcomes the challenge of setting up overseas exhibitions, and sharing his passion for Aboriginal art. Aboriginal art and culture has attracted worldwide attention with its ancient iconography and universal philosophy. The Dreamtime Stories depicted in their art reveal 40,000 years of history and demonstrate a respect and love for their inherent culture and land. Each painting tells a story which represents a particular song and dance. Harmony with nature and survival without destruction are paramount issues in Aboriginal art and culture. The oldest civilization known to modern man, Aboriginal Art has no written language and consequently relies on storytelling (through painting, song and dance) to pass Dreamtime stories on, from one generation to another. International focus and a greater appreciation of Aboriginal Art have fostered the development of contemporary movements and a further understanding of traditional Aboriginal culture. Acrylic paintings are merely a new form incorporating the classic elements of Aboriginal Life. They state a person's relationship to those around them, to the land and to the Dreaming. Yet they also represent a new context of interaction between indigenous and western societies. Through modern art the Aboriginal people are able to introduce and express their culture to the world. The traditional art of the vast Central Australian Desert has always been complex and impressive. Used in ceremony it was performed on large, irregular surfaces such as rock walls and slabs. It was also painted on the body and artifacts such as shields, sacred boards and ceremonial posts. Acrylic paintings by Central Australian Aboriginals are one of the most exciting developments in modern Australian Art. Though the materials are European of origin the content and execution of the paintings lie firmly within the framework of Desert Aboriginal Culture. The paintings are mythical representations of landscapes or conceptual maps of designs wrought by ancestors. In this tradition sculptures, paintings, dances and songs relating to the Dreamtime are repeating the work of Ancestors, thus keeping the world alive. redrock gallery and managing director Mem is a proud sponsor of the Australian indigenous culture and wish’s to thank all of our Aboriginal communities and friends who have made me feel most welcome into their lives. I would also like to thank all of you who have given us your support over the years.